It was the wedding day for Polly Blewett that was approaching as fast as the Great Blizzard. Polly of St CIare Street at Penzance, was due to be married on Tuesday March 10 in 1891 and several guests were travelling to Cornwall. The train, The Dutchman, did not arrive at Penzance on that frightful Monday. 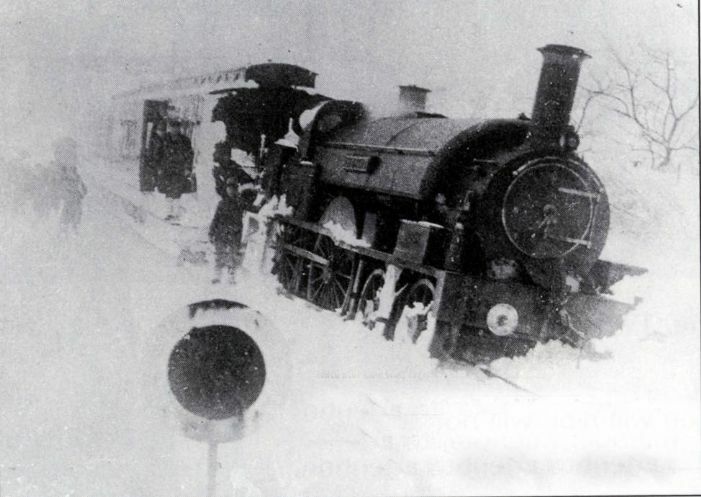 It had left London at 11.45am, was timed to reach the Cornish terminus at 3pm but was snowed up near Camborne. There was a stop for an hour at Truro. About 200 yards from Camborne station the engine and front coach ran off the line on hitting a drift of snow. The station master took five ladies on from the train to his house and the booking clerk took jugs of coffee to the remaining passengers. Several stayed the night at the Railway Hotel at Camborne. The snow and the cold was a surprise for some who were returning home from the sunshine of South Africa! The train arrived at Penzance at 3 pm on Tuesday ‘the experience was one I would not care to repeat’ said the groom’s brother, and the postponed wedding took place on the Wednesday.